With Halloween almost here, people should remember that not everything that comes out at night is scary. 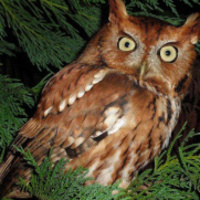 Join the park naturalist in a night hike to learn more about some of the things you might encounter in the woods after dark. Dress in dark-colored clothing and bring a flashlight. Insect repellent is also reccommended. No pets, please. Meet at the gate at the top of the dam.